Several miles east of the village of Innerwick, near Dunbar in East Lothian, perched on top of a sandstone outcrop, overhanging the Thorton ravine stands the vaulted basements of Innerwick castle. The present ruin dates from the 1400's and 1500's and was a keep with an outer courtyard wall, with a gradual infill of additional buildings as time went on. The original castle site though dates back to the mid 1300's when it was built for the Stewarts. 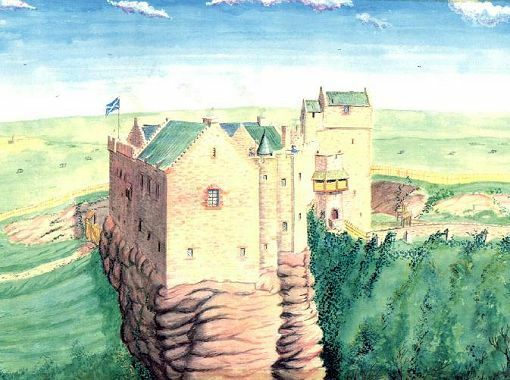 In 1398,the castle passed to the Hamiltons, ancestors of the Earls of Haddington. In 1403 Innerwick was besieged by the English knight 'Hotspur' Percy and Archibald 4th Earl of Douglas, a Scot held by the Percies since the defeat of the Scots army at the battle of Homildon Hill, near Wooler, in 1402. 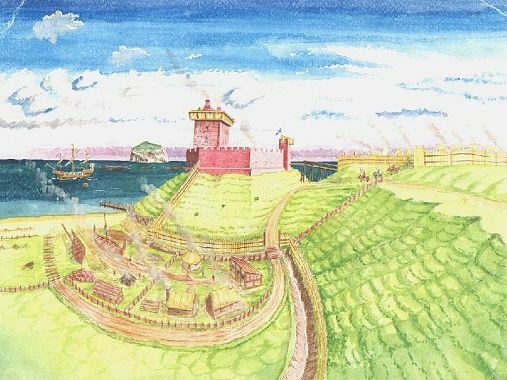 However the siege of Innerwick and it's near neighbour Cocklaws tower, a Gladstone house, proved to be a mock affair and a smoke screen, for when the Duke of Albany arrived with a large Scots army to save Innerwick and Cocklaws, Percy and Douglas had headed south-west to contact Douglas vassals and march on Wales. Percy, Douglas and his men were now in league with Owen of Glendower in open revolt against King Henry IV of England (1399-1413). But at the battle of Shrewsbury 'Hotspur' was killed, Douglas retaken captive and the rebels defeated. In 1547 Innerwick was attacked by the English during the wars of the 'Rough Wooing'. This was where the English insisted by force that the child Mary Queen of Scots (1542-1587) be married to the English Prince Edward. 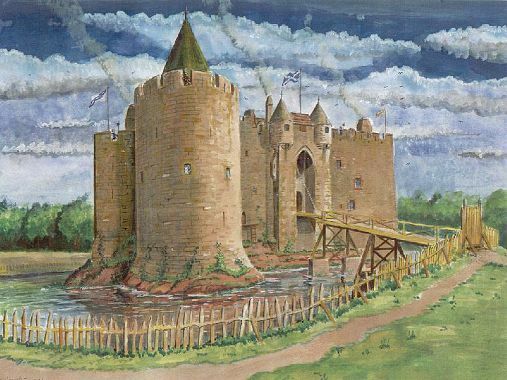 One English force attacked Thornton castle, a Home stronghold, directly across the ravine from Innerwick. While a separate English unit of hakbutters (an early type of rife) besieged Innerwick itself. The Master of Hamilton and eight other gentlemen barricaded the doors and defended from the battlements. Part of the castle was set ablaze and the hakbutters entered by storm, killing eight of the defenders on the spot; the ninth jumped from the castle battlements much to the disbelief of onlookers falling some 60 to 70ft.into the ravine and river below. The English commander conducting the siege of Innerwick was so impressed by this feat of daring that he called for the man's life to be spared. However, as he made his way upstream he was shot dead by the other English force attacking Thorton castle. Following this Thornton was demolished and Innerwick dismantled. 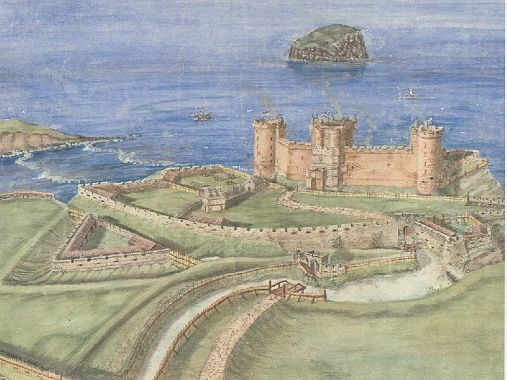 The castle of Innerwick can't have been completely destroyed as it was being used by Scots horsemen, in 1650,as a base to attack Cromwell's supply lines, in conjunction with the raids made by the 'desperado gallants' of Tantallon castle, near North Berwick and the 'moss troopers' of Dirleton castle. It appears though that Innerwick was 'quitted' by the Scots as only Tantallon and Dirleton are recorded as being bombarded and stormed in letters of the time. The occupation of the Lothians by Cromwell, and his systematic destruction of castles therein, proved that the days of the mighty stone castle was over. Modern cannon could fell any monument great or small. For this reason from the 1650's onwards castles were no longer repaired or rebuilt as the expense made it a futile exercise. Innerwick like so many other castles fell the fate of being viewed as the local quarry.